Why does paleography work, and how did we get it? 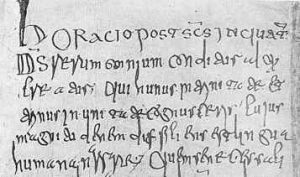 Paleography is a technique for dating hand-written copies of ancient or medieval texts by looking at the way that the actual text is written; the shapes of the letters, abbreviations used, and so on. I’ve found by experience that laymen often don’t understand how it works, or why it works. Only yesterday I came across a book by a German crank asserting that Augustine’s Confessions, composed before 400 AD, were in fact written by Anselm in the 11th century. The existence of physical copies written before that – the earliest copy of the Confessions is in fact 6th century – was dismissed airily; the copies were dated using paleography, and paleography was bunk. It’s not an uncommon mistake in certain circles. I’m not a paleographer, and I only understand the fundamentals. But I’d like to share what I have, in hopes of minimising further crass errors. Many things are best understood when we know what the problem was that gave rise to them. After the end of the Reformation in France, and in the century before the French Revolution, the country was governed as a Catholic autocracy by the Bourbon dynasty. The church held wide lands, much wealth, and great power. The nobility and the various monastic orders fought among themselves to acquire yet more, under the smiling gaze of the Sun King or the other royal despots. Junior or more recently founded orders like the Jesuits naturally found themselves at odds with older ones like the Benedictines. The Jesuit Daniel Papebroch advanced the claim that many of the old charters, granting lands to these orders, were in fact forgeries. Among them he listed a grant by an early Merovingian king to the Benedictine order dated 590 AD. Of course this was no mere bit of scholarly noodling; if true, vast wealth would pass out of the hands of the order and back into royal hands. The Dominican order took this as what it was, an attack on the privileges of the church. They demanded that the inquisition investigate Fr Papebroch. The Benedictine order took a different view. The ancient Benedictine houses of France had regrouped as the Congregation of St Maur, with their headquarters in Paris at the abbey of St.Germains-des-Pres, and had emphasised scholarship. So they saw the claim as an intellectual challenge. The task of defending the order was given to Dom Jean Mabillon. Mabillon theorised that the types of “book hand” changed over time; and also that they changed from country to country, (although in fact the location proved less important). So he compiled a big reference volume, consisting of examples of the writing from charters or books that he could date. It’s possible to date most charters. They come with a signature at the bottom, of somebody important, and often with a phrase like “Given at our court in Aachen on the 23rd of May, 840” or something like that. Likewise books may have a note at the end such as “Completed by the monk Ernald in the eight hundred and twentieth year of our Lord.” Of course the dates may be forged – that’s the question before us – but they can’t ALL be forged! So Mabillon started with these. He drew up examples, with their stated dates. And … bingo! He was suddenly able to see, what no man had ever seen: the change of scripts over time from antiquity to his own period. Because of the volume of data, he could see what the real book-hand was at various periods. And, armed with this, the forgeries stuck out like sore thumbs. Because the forgers did NOT have Mabillon’s knowledge of old scripts and the dates in which they were in use. Indeed they didn’t actually know that scripts varied, or why. So whatever they did, they were screwed. It was possible to see, at a glance, that many of the early charters were indeed not what they appeared to be. In fact the Merovingian charter that had provoked all this was shown to be written in a later hand. It was now possible, using this database, to date many other books that had no scribal note at the bottom. Mabillon published his data and results in 1681 in his book, De re diplomatica. It met with universal approval. Even Papebroch hailed it as an achievement. This was the birth of paleography. The word itself had to wait until Mabillon’s colleage, Dom Bernard de Montfaucon, did the same task for Greek manuscripts, which he published under the title of Paleographia Graeca. To this day, paleography adopts the same method. The first step, in creating a paleography for any culture, is still to create an album of “dated and dateable manuscripts” – this phrase appears in the title -, with pictures of the scripts. The next step was to refine these broad-brush classifications. This indeed is what paleographers still do. Parchment is expensive, so most documents and books were abbreviated with signs like “&” for “and”; or space was saved by the use of “ligatures”. Today we have only one or two of these: “æ” for “a” and “e” saves a precious bit of space. But there were hundreds of abbreviations and ligatures; and these too varied over time and space. This also gives us information with which to localise the production of a book. There are limits to the method, which are obvious. A scribe may be active for 25 years, and write the same script in which he was trained over the whole of that period, even if a new style has come in. Paleography becomes more unreliable, the smaller the database, the shorter the time-span. Inevitably subjective judgements creep in. How closely a document may be dated by paleography may be questioned. But I would imagine that we can reduce the date to within a century without too much difficulty in most cases. A specialist might do better. It is often asked why carbon dating is not used instead. But of course it was not available to scholars in 1681, or indeed until very recently. Even then, the accuracy of carbon dating is often no better than paleography. A further problem is that carbon dating will give the date at which the parchment was harvested, not the date at which the text was written. Parchment was reused for centuries. Also carbon dating requires the destruction of a portion of the book or charter, which rarely is acceptable to the owners. Finally paleography may also give us the monastery at which an item was written, which carbon dating cannot. But this is an area in which technology is progressing. The size of the sample needed is reducing all the time, and probably there will be more carbon dating of manuscripts in future. Paleography is a valuable part of the scholar’s toolbox. It will continue to be so, for the foreseeable future. How words are spelled, and where and when, is also important to paleography, although it strays into the field of linguistics and philology. Good point, and very relevant. Words like Vae becoming Ve is a date marker; paenitentia, poenitentia, poenitencia, etc.